​Bentley belongs to Sharon and Randy in OR. ​Aussiedoodles. :o) Bentley was born in 2016. We just wanted to give you an update on how Iris is doing. She's almost 13 weeks old (as I'm sure you know) and while she's still small she's definitely growing well. She's almost the same size as our cat but still significantly lighter. Speaking of our cat, they are starting to get along a lot better! They're doing an okay job of playing although Theo (our cat) can only put up with Iris for about 5 minutes or so before he gets tired and hides. She is doing a great job of learning. We still have some pee accidents every once and a while, but we never have issues with pooping in the house. She is also doing a good job with her crate training! She still whines and barks a little when she first gets put in her crate but she is mostly sleeping through the night in her crate now. Iris is quite the smart puppy and really likes learning tricks! She already knows sit, down, up, stay, roll over, and shake, and we're currently working on her obedience training and her leash training. We love her so much (as do all of our family and friends) and she is just as cute as ever! Thanks again for letting her come and live with us! 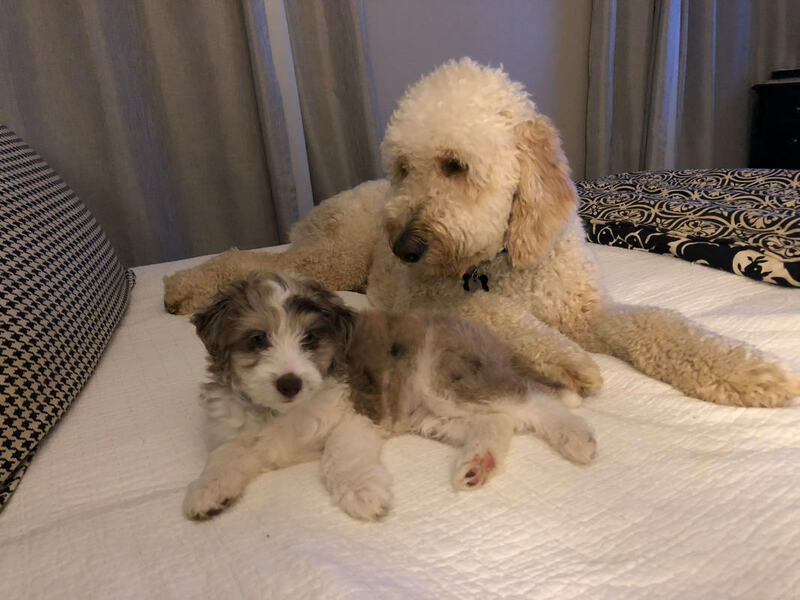 Looking for a larger Aussiedoodle Standard or Moyen size 40# F1 or F1b female to live with my sister in Vermont. Would prefer a blue Merle if possible but other colors may be considered. Please let me know if any litters are coming that may meet my criteria. Annie has been so special I would prefer to get a pup from you. ​"We love our pets! Thank you so much! I thought I would send you an update! The grey Aussie was Amos when you had him. My dad named him Smokey. After my dad passed, my great niece and her sister started staying with their grandma, and I help care for them. They have been calling him Albert; therefore, he goes by Smokey and Albert! He is so smart! We love him to pieces and he is fantastic with my niece who is 2 years old! Just her size! The blonde Aussiedoodle we came and picked up for my daughter. I am not sure what her name was when we picked her up. My daughter named her Manhattan nicknamed her Hattie! She is doing great! She is MaryAnn’s partner! We are so happy with both of them! I had told you we would send pictures! Thanks again!" Thought you could show how adorable they are full grown. We love her so much! She now weighs 11 pounds. Thank you for bringing a best friend to our family! 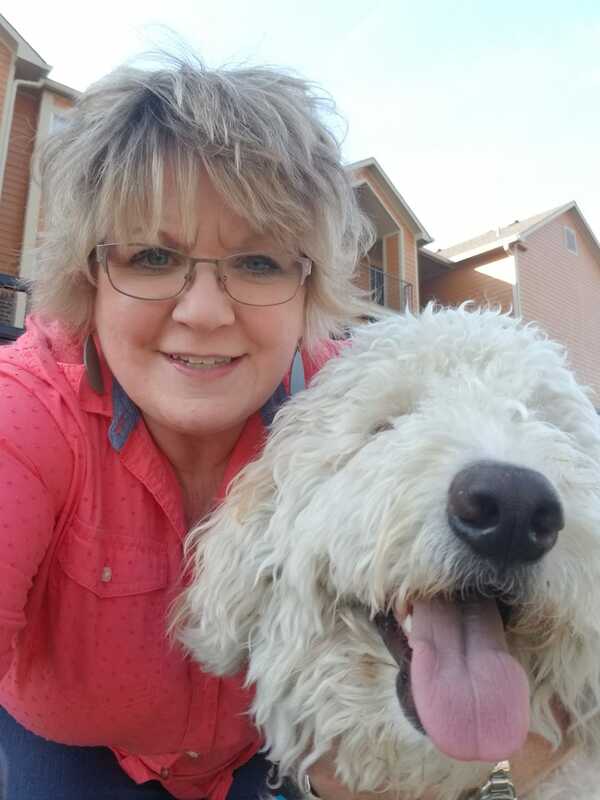 Libby is one of Phoebe's Goldendoodle puppies - she is living in Texas with her family. :o) We got to meet in AR - and here is what Andrea wrote - once they were back home. "Hi good to hear from you. The drive seemed shorter on way home. She has done great no accidents in the car or house it seems like she is pretty much potty trained to me! She started whining yesterday, not long after she went outside, so I took her out and she went potty. So I’m really impressed. She does whine a bit in cage but stops after a while. we’ve been doing small intervals of being in there. She’s been sleeping with Paisley at night and won’t even try to get off the bed. . . ."
Just wanted to check in. We renamed Napa, Libby. Hopefully she will be Libby the Library dog!! We love her. She is so sweet and gentle. She has met with the superintendent and did awesome. She went to school two days last week and acted like a pro. She will be starting obedience training after Christmas. Then hopefully be ready to pass the therapy test right after she turns 1. She loves to fetch and having her belly rubbed. I think our school may be looking for more therapy dogs soon. Everyone just loves her. Thanks for raising such a good dog!! Thank you !!!! We absolutely love our girl!!! She has brought sooo much joy To our lives and the clients in my office! Please send pics of other litter mates if you have them. She weighs 45-50 I think. Feel free to use pics of her on your site. We take some everyday! She loves the dog park, doggie day care and my office. She finds the fastest dog and runs them . When they get tired, she finds the next dog to run with! Lol. Loves running! She was house trained quickly and I am currently leaving her for short intervals without crate.! Doing great on everything! She loves jumping when she sees me. I swear she jumps 3 ft off the ground. I took her to one round of 8 week puppy class early on and am starting two classes with her in Jan , one is brushing up on commands the second is for therapy dog. Best dog I ever had with temperament! I have had dogs all of my adult life, she is adorable and all my friends and family think the same! You guys have done a fabulous job! Please continue to do what you are doing... you bring joy to so many people! Thank you Mary Ann from my heart! We are just so in love with Mischa. She is fitting so nicely into our little family and has already brought us so much joy! We’ve explored our neighborhood and took her for a walk to see some Christmas lights. Her potty training is going amazing and she even lost a tooth! Here are a couple pictures of her with our boys and Maggie. Thank you so much for allowing us to adopt her... we feel so blessed! ​Thank you for providing this amazing dog to us! She is smart as can be. We have never seen a dog her size run so fast. getting very good at it! (bc she’s Aussie & Bindi is Steve Irwin’s daughter’s name). great mama to our new little one. They sleep together in the laundry room. No one has cried or pottied in there so far! We are all in puppy heaven! Thank you so much for raising such a sweetheart. I’ll send more pics! It looks like one of her eyes may be turning brown? That would be cute! Does this usually happen? Hi Mary Ann, Shay is doing wonderful. Just wanted to send you a quick update on our boy Gus. He is so loved. He’s the most gentle calm puppy I’ve ever met. 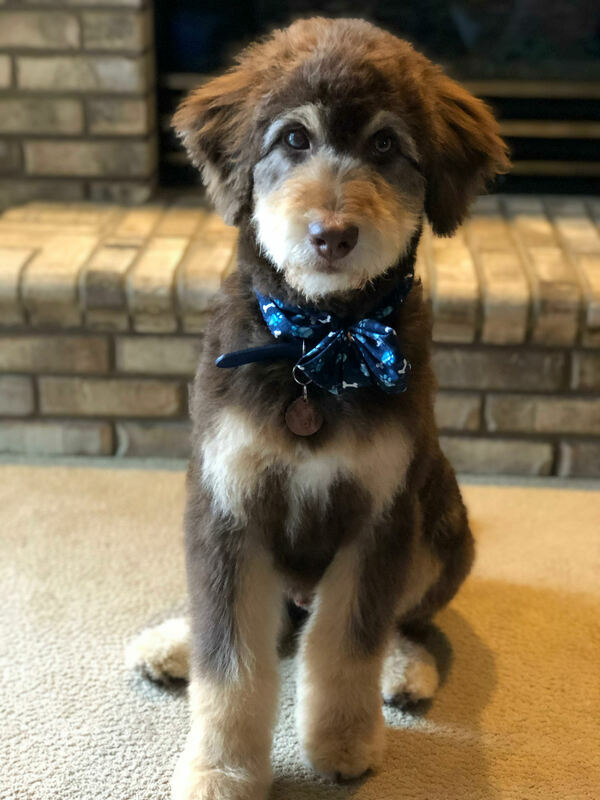 He got his first haircut today and it’s safe to say he is the most handsome puppy in the world. Well it’s been a full week. They are so perfect. We’re getting to know each other still, but we’re coming along well I think. They are so different personality wise. Teddy is just so sweet, friendly, calm, cuddly, and loving. Alfie is aggressive, a bully, has an attitude, and very stubborn. But lucky for him he is so handsome that it’s easy to forget all that. And those eyes! Melt your heart! They play so well together and are really inseparable. They don’t really like their leashes yet or going for walks. But we’re working on that too. They much prefer playing in the yard and skipping the walk! They checked out perfectly at their vet appointment on Monday. I brought them to my friend’s house, she lives on the river, and they absolutely loved the water, they ran right in and played. They sure did need a bath after that though!! Hope you had a safe trip back home. Thank you again for driving them. I’ll keep you posted on our progress and more pictures! "I love him so much! He's wonderful!! He's not that shaggy now! He always looks like he is smiling." 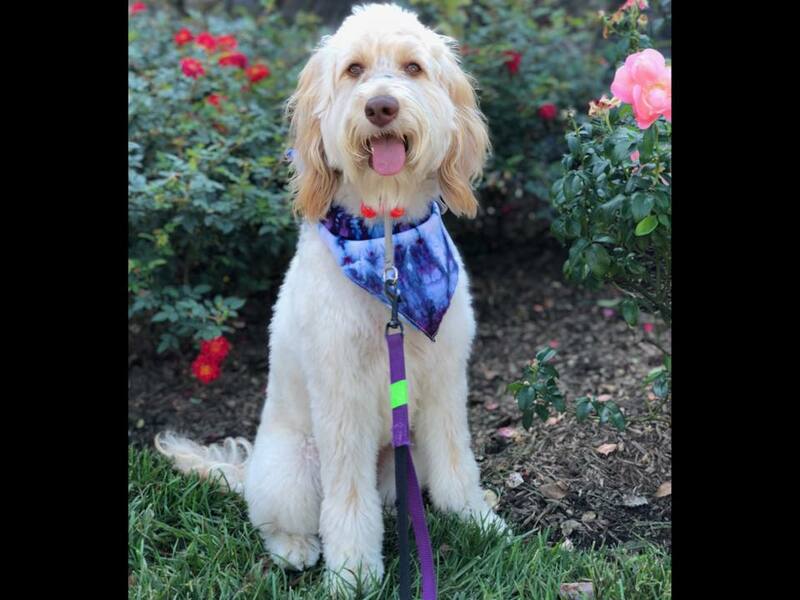 "Thank you for a great experience and a wonderful puppy!! We sure are loving our girl Kaya (queeny)! She's the happiest, healthiest, most obedient dog you could ask for." "It’s been great. I ended up naming her Rayna instead. I went ahead and changed her microchip to that name also. She is named ‘Hearthside’s Rayna Leigh’. She’s very smart and is doing great at house training. She has decided she likes to chew on my old reading glasses while we watch TV. This is a picture that I sent my husband while he was at work. She is really small so I pray she will grow bigger. Hope you are doing good and glad you enjoyed your trip!" Hi - I just wanted to thank you for the wonderful job you did raising Roll Tide. He is sweet, happy and in excellent shape. He arrived on time and was very happy to meet me. Thank you for his toys and vaccination records as well as his supply of food. He doesn’t like being in a crate so we eliminated that part in trying to housebreak him. He is doing great having free to of several rooms in our house. He chewed his way out of my soft side crate but didn’t get into any trouble. He was quite proud of himself for figuring that out. He’s a very smart puppy and everyone that meets him falls in love with him. Hi, we received puppy Lewis Friday and got him home that afternoon. He is such a sweet boy and so smart! This morning we all went to the vet for his checkup and certification and they were impressed with his health and temperament. Attached are some pictures of us together, I slept with him on the sofa for two nights. He already goes in and out of two dog doors. We live on 2 1/2 fenced acres and have a nine year old Aussie who is his big brother. Thank you so much for all the gift bag items and the wonderful care and support we have received. We have quite a few reviews from wonderful people on our other site - http://www.hearthsidemeadow.com/testimonials.html and it would be so nice for you to go and see them on there. Thank you. :o) I'll be posting new ones on this page, as much as possible. We love hearing from everyone. Thank you for staying in touch. Thought u would enjoy seeing just a few pics of all the fun we are having with Rudy. He sure is a sweet, good boy! Max is from one of our first or second, Goldendoodle families. He is definitely living the good life in IL. Thank you Kirk - for sending us pictures of this sweet boy.